Banners for advertising, banners for general signage or banners for temporary signs. 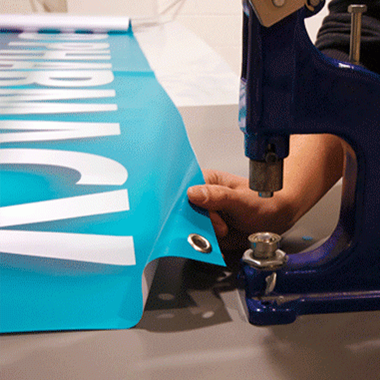 One way or another there is not a banner application where we have not been able to supply the right eyelet. The Advertising banner industry in the UK is well known for being able to respond quickly to customer demands and at Bodill Parker we understand how important it is to have a wide range of eyelets available for our customers to give them the flexibility and service they need. Our eyelets, rings, grommets and spur tooth washers are used in banners for many advertising and exhibition companies, they are hard wearing withstanding harsh weather, and they are manufactured in brass and stainless steel and can be plated in various colours to suit your needs. We specialise in our long eyelets and rings which are popular with the traffic management industry, hard wearing for all weather and are used in various materials such as Aluminium, Perspex, Correx and Foam Board these are just a few. With a wide range of sizes we are sure to have something to suit your requirements.